What good IKEA kitchen designers aim for in applying their experience in each kitchen is a flexible, adaptable space in which work can be done with maximum efficiency. Combined landing areas need to adapt to your cooking needs. 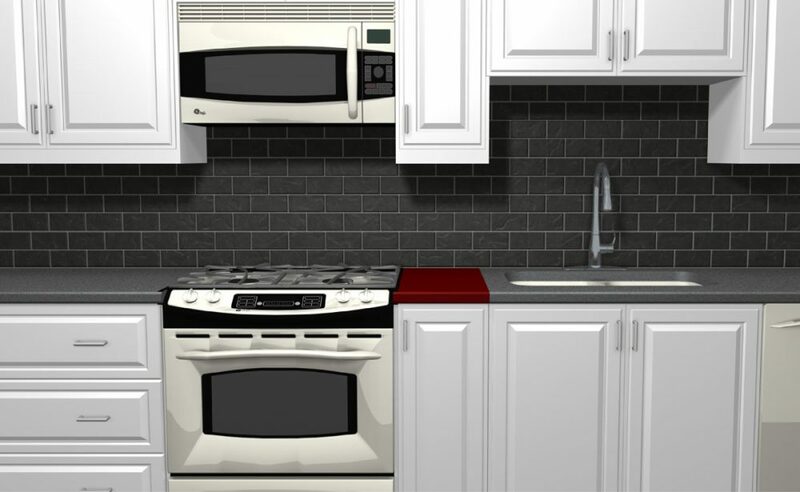 This time, we’re giving you tips for a better IKEA kitchen design. A well-thought IKEA kitchen design encompasses these guidelines for combined landing areas and much more. It’s the “much more” part that gets novice IKEA kitchen designers in trouble. A new kitchen is a major investment, and not something you are going to want to do over because the first design was not quite right. So, what’s a ‘landing area’? It’s a countertop space that allows you to place (or “land”) items from sink, refrigerator, cooking surface, and oven service areas. The countertop is adjacent to these areas. For example, if a stove has no nearby landing area, the cook may be tempted to place a hot pan that she has just removed in a close but unsafe spot–perhaps on top of the fridge or on the floor. A landing area is simply a way of describing the absolute minimum amount of countertop needed adjacent to one of these areas. You’ll need a combined landing area of at least 36″ between the sink and the range. There should be at least 48″ of counter space between the fridge and the sink.